Aileen skippered by Brian Roberts in pre-season tuneup race. Tactical dilemmas made it anybody’s race to win with a mile of water to go. On the final leg of the Holmes Hole Sailing Association preseason tune-up race, held over the past weekend, competitors faced a bewildering combination of current, wind, water depth and sailing rules. With the tide pushing west so hard it laid big navigation buoys over at an angle, and an easterly breeze building steadily, the variables that went into tactical decisions were enough to weaken the sea knees of any sailor. 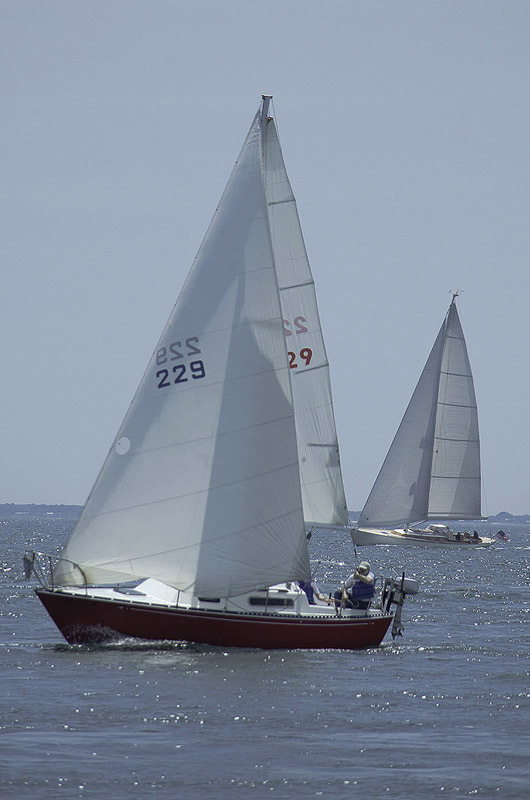 Tack out in Vineyard Sound, sail a longer course but avoid the stronger shoreline current? Slip under West Chop, risking shoal water to catch a wind shift or favorable eddy toward the final mark? Take advantage of the strengthening breeze and sail a shorter distance, but barge into the strongest part of the adverse tide? Aboard King Kiwi, a Sabre 38, skipper Irving Gates and crew decided on the first option, sailing a longer course, but against weaker current. With a collegial potluck dinner Saturday night, and the tune-up race Sunday, the Holmes Hole Sailing Association begins another season, striking a balance of hot competition and warm friendship. 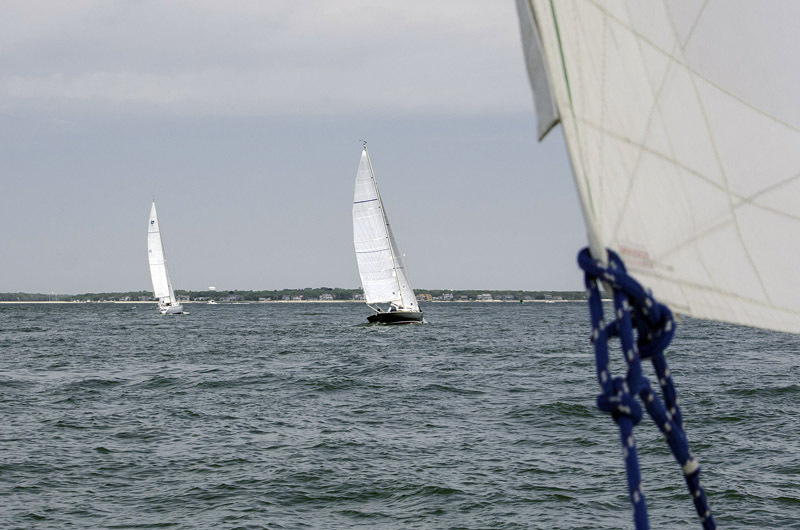 Every Thursday evening and Sunday afternoon until Labor Day, as many as 25 boats will meet in outer Vineyard Haven harbor to race for fun and bragging rights. A complex handicap system gives every crew a chance to win, and rewards improvement and participation as much as sailing skill. With no barrier to participation other than a modest $60 annual fee, the organization draws a diverse group to the starting line. 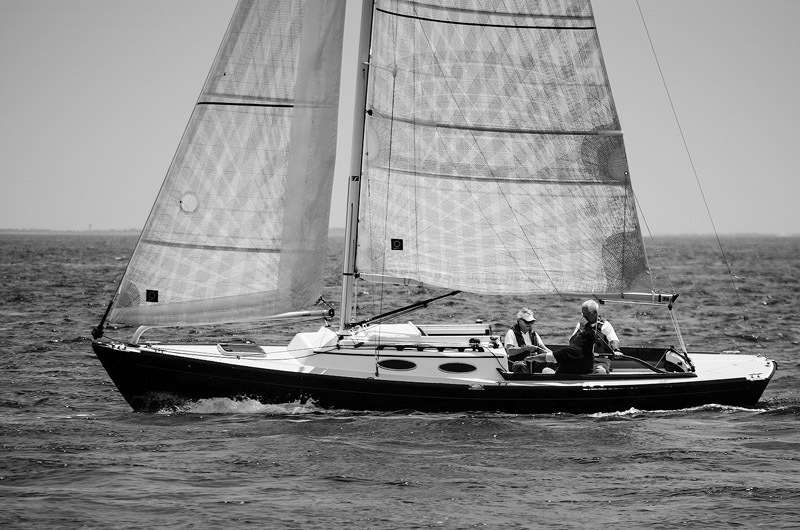 Mo Flam, who sailed his Alerion X28 Penelope to the season championship last year, agrees. The Holmes Hole Sailing Association began in 1976, dreamed up by some of the Island’s best local sailors as a way to skip the yacht club culture, restrictions and expense and create a competitive racing series. Frank Jewett, Pat West, Hugh Schwarz, Harry Jones, Tom Hale, Tom Mendenhall, Joe Low, Hank Scott and Bud Haven were among the early organizers, according to a history of the organization. Another of the early movers and shakers was George Moffett, who is honored each year as the namesake of the season ending competition, called the Moffett Race. Over the years, the Moffett cup has grown in stature and legend, and it is a fiercely desired trophy for local sailors. In recent years the race, held the weekend following Labor Day, has drawn 50 to 60 entries. None of it happens without many hours of volunteer work. 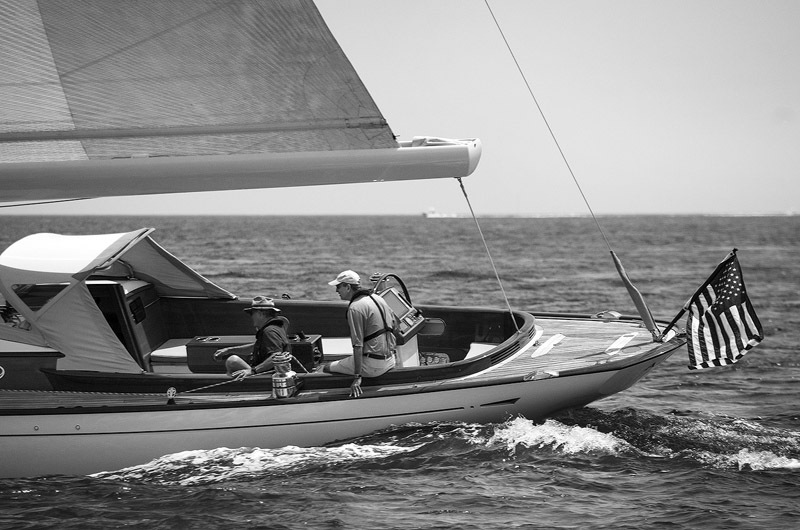 The Vineyard Haven Yacht Club provides invaluable support, including a committee boat to organize the start of the races, and a gathering space for mostly-true stories to be told after the racing is done. Crews who win the season championship are assigned a penalty of 15 seconds per mile for the following season, which makes it very difficult for one boat to dominate the standings. Mr. Roberts, at the helm all the way, won the tune-up race, with the best elapsed time and corrected time. Finishing second on corrected time was Tom Welch aboard his J/100 Escape. And King Kiwi? That decision to sail a longer course out in the middle of the Sound, but avoid the shoreline current was either lucky or smart, because King Kiwi made up a lot of ground to finish third of 11 boats overall on corrected time, and first of the eight boats in the B class. “It was good to be sailing again,” Mr. Gates said.